BSH Home Appliances Ltd is a subsidiary company of BSH Hausgeräte GmbH, the largest manufacturer of home appliances in Europe and one of the leading companies in the sector worldwide. The group was founded in 1967 and since the beginning of 2015 BSH exclusively belongs to the Bosch Group, headquartered in Munich. BSH Home Appliances Ltd offers a complete range of kitchen appliances from cooking, refrigeration, laundry and dishwashers through to small kitchen appliances, vacuum cleaners and home comforts from four brands, Bosch, Siemens, Neff and Gaggenau. We are responsible for all sales and marketing activities in the United Kingdom and the Republic of Ireland. Our headquarters are based in Milton Keynes, with a state of the art warehouse and Customer Service Centre in Kettering, a prestigious Gaggenau showroom in the heart of London, as well as an office in Dublin. Over the past ten years the company has grown rapidly and now ranks amongst the top three kitchen appliance groups in the UK with an annual turnover of £656m (2015). In February 2016 and 2017, we were awarded Top Employer status in the UK and we employ a dedicated workforce of around 1150 employees. BSH has set itself the target of becoming the leading company in the United Kingdom and the Republic of Ireland by 2020. As a company we are keen to bring new life and experiences to help mould the future of the business. 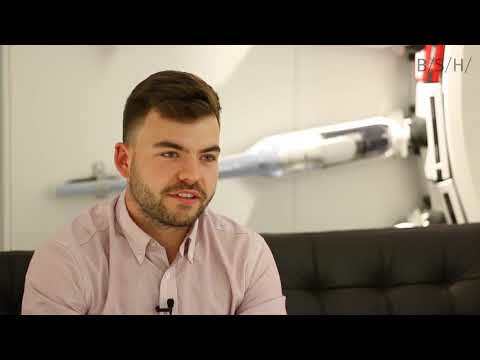 An Intern at BSH is given the opportunity to work as part of the team they will join, taking on projects as well as day to day work to truly build an understanding of how a global company works. I have been able to work on tasks and projects that have had high importance for the company.